It’s always a minefield to compare one wine grape to another, especially when styles around the world vary so much but in terms of Catalonia’s Trepat grape and Pinot Noir, there are more aspects than just light color and a good deal of tightness when young. The most important one is how much both of these grapes go in making sparkling wines. Pinot Noir is one of the three grapes in Champagne while the mast majority of Trepat grown goes in to Cava production. Slowly, this is changing in Catalonia and DO Conca de Barberà (no, not the grape, Barbera) is responsible for a great deal of this as the 1,000ha that exist in Catalonia are almost all in this DO. Several bold cellars there decided that this grape, which is seen as being native to the region, deserved more attention than just being fed in to the machinations of DO Cava and so they started to make wines that of 100% Trepat. This slowly grew as time went on and in 2010, they held their first Festa del Trepat in the village of Barberà de la Conca to feature wines that were anywhere from a majority to 100% made of the grape. 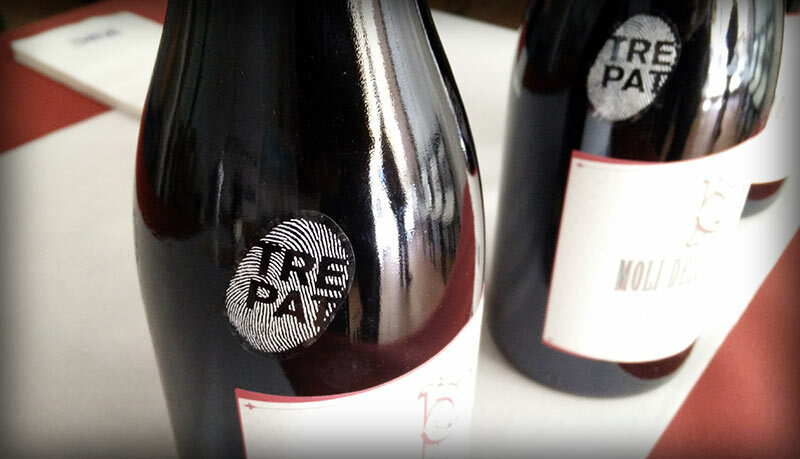 The interest has continued to grow and this past April in Barcelona they presented their new “TRE PAT” campaign in order to draw even more attention to the grape with a new sticker (seen above) on wines that are primarily made of the grape. Everything came together this past weekend in the 7th edition of the Festa del Trepat where the wines now being promoted under this campaign were available to taste. In total there were 14 cellars and they showed a magnitude of styles as one of the issues of Trepat is how to work it. I found that both maceration and harvest times varied wildly. Some wines like those of Rendé Masdéu showed the usually associated youthful crisp aspects to the wine while others such as Succés Vinícola were darker and more brooding showing that more is indeed possible with this grape. Others such as Vins de Pedra were interesting to taste as well given that the evolution of Marta Pedra’s 100% Trepat called, “Trempat” (bit of an inside joke in Catalan) has been marked and fast taking the wine from being unruly to approaching a character considerably more rounded-out and elegant. If you were to ask me how to summarize the vinification of this grape currently, I couldn’t give you a simple answer other than to say it is evolving rapidly and with a great deal more clarity than what I’ve seen with other minor varieties in Spain. The “cellar incubator” (called a viver in Catalan) that the DO set up to stimulate growth of new cellars has worked splendidly and I find it to be a large part of why so many people are now stepping back from just selling off the grapes and seeing what they can do which is unique and forward-thinking. My only criticism is that the wines are being sold off primarily as young variants and very few are working to see what extended aging will do to the wines. I feel that, given is full, tannic structure, the wines could hold the potential age very well. The criança wine from Molí dels Capellans shows this quite well but even it could stand in the bottle for another year to see full integration with the oak. But overall, an exciting direction in such a short time for a grape that was otherwise not highly-regarded.